Originally uploaded by Wilhelm Augustus Hohenzollern. Long time, no post. Sorry about that - I've been enjoying a largely internet-free couple of weeks with family (both mine and Marie's) in Australia. 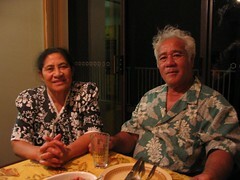 This photo is of Marie's dad's cousin Setu and his wife, Fa'asinoala. They're Presbyterian ministers in Newcastle, Australia, and two of the most remarkably humble people I've ever met. During the late 1980s, Marie, her sister and her mother lived in Newcastle for five years. Although it's a relatively short period of time in the big scheme of things, those five years were foundational to Marie. And a lot of it was due to these two people. Setu and Fa'asinoala are not only leaders in their church, they're leaders in the Samoan community in Newcastle, a relatively small town in a huge country - and back then a very white one. They helped their community retain a strong sense of identity while still participating in, and contributing to, the wider world. Being a religious leader in Samoan culture can be a sweet deal - people give you lots of money and food, generally. But this couple knows what their job is really about - the people. And people are their main priority; on the day we left Newcastle, Setu said, tears in his eyes, that he never wants anyone in his care, young or old, to say that he never did anything for them. The Christian tradition is full of words about humility, and it's easy to just echo the words and not live the reality. But Setu and Fa'asinoala display the genuine humility that's written about in secular classics such as Jim Collins' Good to Great - knowing that their true work is reflected in the people they're responsible for.